Beautiful, Ash! I love the little flags, they are so adorable! I'm saving this idea for my sister's birthday - I am sure she's gonna love it! These are so sweet. Love that picture! Happy Walentines day! These cupcakes are so cute. I adore the flags, they look fantastic! OMG! I think I'm in love with these cutie patootie flags! Super cute flags and banner, and those cupcakes look delicious! Beautiful photography as always Ash. These cupcakes are so cute - love the flags! I love this picture. May I ask what the brownish background is? Probably just a brown wall but still! Lick My Spoon: Thanks! It's actually just a large brown piece of craft paper. Sweet Vanilla.... Love those extended flags!! 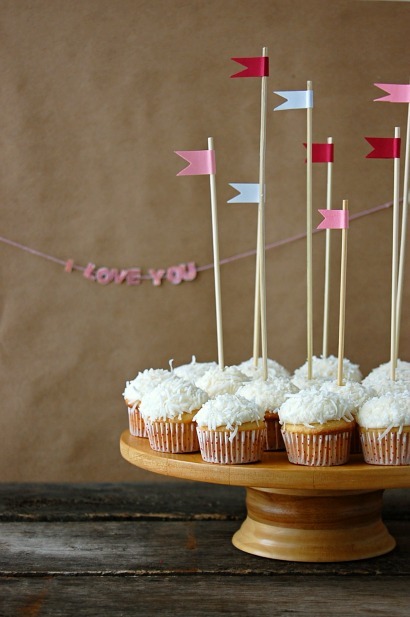 I absolutely love those little flags - just threw a party for my daughter and decorated her cupcakes like this b/c of your blog! Love your eye for design!